The Beresheet Space Lander aborted and with it went my Reasons 2B Cheerful this week. And the political party I voted for - Gesher - did't even pass the threshold to get one seat in the Knesset. Otoh, we got to the moon (first country to crash on the moon. Hooray, a first!) and we still live in a democracy which is a huge deal. So with the R2BC linky over at Mich's Mummy from the Heart for the month of April, here are mine for this week. I found out that they take polling boxes to women's shelters so that the women don't have to go out in public if they can't. Also, in every city there is a safe polling station for people who feel threatened by going to their local station in case they meet a dangerous ex, family member, or previous attacker/abuser. How amazing is that? To know that your vote is important when you're perhaps feeling at your most low and vulnerable is truly a wonderful thing. The first thing everyone involved in SpaceIL said after the failed moon landing was: Next time.... We are delayed, not defeated. The Passover (Pesach) school holidays have started. DD is out and about with her friends - mostly in the park on roller blades but also in each other's homes just hanging out. What's new is that I don't have to take her or supervise. She makes her own arrangements on her own phone and off she goes. Fantastic! The rains have finally stopped for a while and we can throw open the doors and windows to begin spring cleaning (we call it Pesach cleaning) in earnest. The Pesach foods which have to be separated from the normal foods, are in the supermarkets. It's fun to walk around my local super and find the shelves in complete chaos. Nothing is in its usual place, food groups are split up and put wherever there's a space. It's kinda fun. That's it for today. Have a great week y'all. One selfie from Bereshit before we lost communication. This was supposed to be my Reasons 2B Cheerful post for this week. I had it all planned and was rehearsing the words in my head as I settled down to watch live coverage of the Beresheet moon landing. Today at Ben Gurion Airport, the arrivals boards were announcing MOON at 22.00 (time not finalized). All over the country there were big screens set up with hundreds of people watching together. President Rivlin had 200 children in the President's residency, face-painting, doing crafts and watching at the same time. The Cinemateque in Jerusalem and the Intercontinental Hotel in Tel Aviv to name two more. We watched at home. I put it on the big TV for full effect. Opher Doron, one of the engineers at SpaceIL, explained what was going to happen. The spacecraft was approaching the moon. They were controlling the engines to get it into position. DD was in her bedroom. Me: DD! DD! Come and watch the moon landing. Me: Come on! It's historical! DD comes running down the corridor. DD: Why is it hysterical? DD: Oh, I only came because I thought it was going to be funny. However, she stayed as we both got drawn into the excitement. They hyped it up. 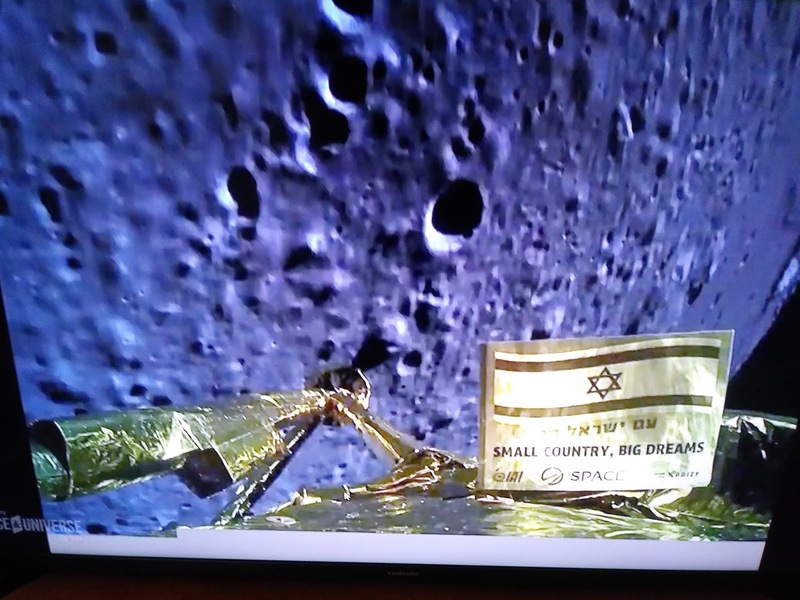 "Israel, the small country with big dreams, is only the fourth country in the world to land on the moon." "In one minute the spacecraft will decide for itself whether the landing conditions are favourable and then it's on its own. We will have passed the point of no return." They explained that if Beresheet decides to abort the landing it will continue to orbit the moon and we can try again in another four hours. Suddenly they announced: "we have passed the point of no return, the landing process has started." We all clapped. The scientists, the dignitaries, Bibi and Sara Netanyahu, me and DD. But then things began to go wrong. "We've lost telemetry." (He pronounced it te-LE-metry. I thought he said that they've lost the lemon tree.) Then they regained telemetry (or the lemon tree) and we were back in business. "The breaking mechanism is in full process, the spacecraft is doing everything it's supposed to do at this moment." Pure joy when Beresheet sent a selfie from the backside of the moon. 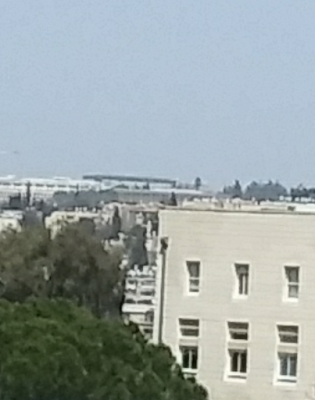 There was the Israeli flag just short of the moon in the background. Am Yisrael Chai (The people of Israel Live - it's a message to Hitler et al.) and Small Country, Big Dreams in English. Lots of frenzied clapping. The excitement was rising but then, "We seem to have a problem with the main engine." "The main engine is back on." We all clapped again with relief. "But it's not, no no, it's not....."
And finally. "The main engine is back on but we have lost communication with the spacecraft. We are trying to get it back...... No, we've lost communication." It was all over. Less than seven minutes to go and only a few kilometres from the moon's surface. The stats said 15 km but Opher said 41 km so I'm not sure exactly. Either way, it's nearer than Tel Aviv from Jerusalem. They tried to put a positive spin on it. "We are the seventh country to orbit the moon and the fourth country to reach the moon (but not land safely - is what he meant). As my friend Jonny put it, Israeli drivers eh? 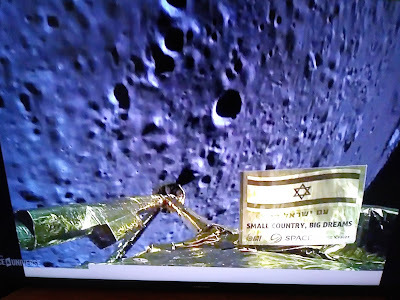 Israel is the first country to crash on the moon. And now I'm going to bed, tired and bitterly disappointed. I can see the Knesset from my balcony. See the enlargement below. 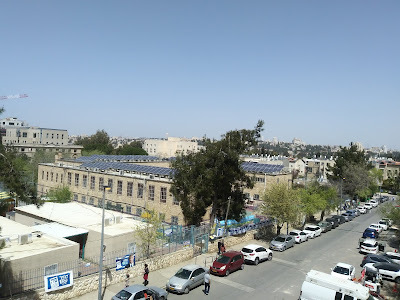 April 9th 2019, General Election Day in Israel. I made my decision. It's only midday and we're at least 20 hours away from any results. However, here are some thoughts and observations on half way through election day. 1. There's a certain reverence in the polling station. perhaps it's the fact that we're all adults and young children. But maybe there's an unspoken awe of being part of a democracy and having the right to vote. 2 And camaraderie. Polling stations are a local thing, so obviously you meet people you know. And even people you don't know get chatting as they queue up outside the classrooms. 3. It felt like waiting to go into the nurse for a vaccination shot. The door opens and one person comes out then the person at the head of the queue goes in. The door shuts. You wait three minutes, and the door opens again for the next person. You go in all serious and, I swear, everyone comes out smiling. It was painless, I didn't feel a thing. 4. And you continue smiling as you emerge into the warm sunshine and walk down the road. As proud as if you've just finished a 12 hour shift at a soup kitchen. As proud as being a Jew able and free to vote in your own country. third building from the top. 5. There's a calm around us. Election Day is a national holiday so no one is in a rush. It's less frenetic than Fridays when you're working towards an early deadline - either the beginning of Shabbat or the shops closing at 3 pm. My friend Dina just wrote on Facebook, do you know what that sound is outside? It's the sound of Sunday. 6. But also a bustle of celebration. families are out picnicking, hiking, and at the beaches. The cafes are full. With each of the 43 parties having a list of candidates up to 120 (but most far fewer) there are about 1,000 of them out on the streets, mingling with the public, shaking hands, visiting your table in the coffee shop. Remember this is a very small country. After such an aggressive and often nasty campaign period, it's good to see everyone just discussing over a cappuccino. 7. I don't understand the purpose of the exit polls. Why scramble to produce predictions only a few hours before the actual results? Seriously, go to the beach. 8. In a few short hours I can turn my phone text notices on again and answer the landline without a barrage of recorded messages from political parties. Otoh, I know that today's happy atmosphere will disappear once more when the election results are announced. Like the Brexit recriminations, everyone who didn't get what they wanted will be sulking and whinging on facebook and in real life. My answer to all of them is, as always, "Darling, didn't you understand how a democracy works when you went to vote?" It's no secret that I voted for Orly Levy's Gesher Party. Their letter code on the voting slip was nun resh. It spells out the word Ner, meaning candle. Now I'll be singing Sarit Hadad's Light a Candle all day. However, as the song goes, a thousand candles in the dark can open up our hearts. April 6th and only my first blog post this month. Things suddenly got hectic with the second round of college exams to grade, practice meitsav (SATs) exams to grade for school, preparing reports for parents' meetings and a making a start on the spring cleaning (in theory 😊). Whatever the weather, I do try not to miss Reasons 2B Cheerful at the end of each week. 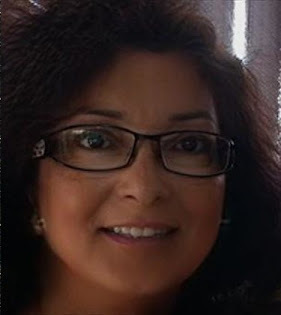 This week we're back being hosted by Mich on Mummy from the Heart. We have a general election on Tuesday and I was in a bind. Along with many many others, I didn't know who to vote for. The way it works is that there are 120 seats in the Knesset and the ruling party must have at least 61 of them. The bigger parties usually only get between 30 and 40 seats, so they then have to form a coalition made up of their party and up to 30 other seats held by other smaller parties. They have six weeks to do this during which time there are usually big compromises that have to be made in the pre-election promises. We all know this. Obviously it's most useful to get the big 3rd and 4th parties in the coalition so there's not much change in policy from election to election. I usually go by the principal that voting for one of the small parties is a wasted vote because we know that one of the big two will win the elections. Better to give the winning party a bigger mandate and more clout so that they don't have to form so many coalitions with demanding parties on the fringe. But this election, neither one of the big two parties sparked joy. Neither Bibi Netanyahu's Likud nor Benny Gantz et al's Blue and White. Both parties have their good points. I have no truck with the "anyone but Bibi" movement, especially from Jews in America and the UK, as their agenda is different from mine. We also have our Bibi haters and it annoys me when they forget that we have lived in relative stability and safety in most of the country during the past 11 years. However, it's probably time for Bibi to go. Otoh, the B&W brigade include top army generals but they have no experience running a country. Then I discovered Gesher. At the top is Orly Levy. A former model whom no one took seriously until she won a seat in the Knesset and started to make changes for social justice. She refuses to be dragged into the Left versus Right debate. Gesher is only concerned with social issues. In the last general election the fight was between national security on the Right and social justice on the Left. Netanyahu won because the majority decided that we had to be alive over and above any other issues - as important as they are. I remember a friend who lives near the border with Gaza saying, "I wish I could vote for the left and everything they believe in, but I have to vote for our safety at this point." This time both sides are about national security and there's no such dilemma. There is a 3.25% of the vote threshold that you have to cross in order to get in. Votes for parties under the threshold are distributed proportionately among the other parties. With 42 parties running, this can be a lot of wasted votes. Election bottom line: Either Likud or B&W will win the most mandates. Both parties have national security at the top of their agenda and experienced military men at the helm. Both parties will ultimately make a coalition with the same other parties. Whoever wins, we will not see much change in actual policy. So, let's get Gesher in the government to deal with the pressing social issues that we all care deeply about. Finally a party that isn't concerned with Left or Right but is concerned about health, education and the cost of living. Left or Right, this concerns you. Please share. A political post may seem like a strange topic for Reasons 2B Cheerful but I was in such a bind about who to vote for that I even considered not voting. I never don't vote. Finding Gesher and making the decision to vote for Orly Levy was a big relief. I also usually keep my ballot secret. However, I'm so happy with choosing Gesher that I'm willing to put myself out there in the hope of reaching a few more voters. The weather and DD's school play are my reasons 2B cheerful this week. The linky is still with Becky on Lakes Single Mum as we see out the month of March. 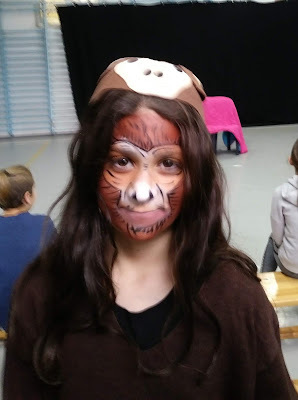 DD was a monkey in her school play. She told me, "I only have two lines but I exaggerate them. She was great! The play was a joint project with students from Nissan Nativ - a film and drama school in Jerusalem (like Rada). Kobi Marimi, our Eurovision entrant, went there. Unfortunately he has graduated and had nothing to do with DD's school play. We've had the rainiest winter following a five year drought. Not no rain, but very little and not in the north, in areas that feed The Kinneret (Sea of Galilee - not a sea at all but rather a largish lake, smaller than Lake Geneva for example). When we went there in the summer it was a good walk down to the water, over what had once been the rocky sea bed. It was very sad. And two islands have appeared where once there were no islands. However, this year the lake has filled up to above the Lower Red Line for the first time in two years. There are two red lines. The Upper Red Line, set at 208.8 m below sea level, is full capacity and they open the Deganya Dam to send the excess down the Jordan River to the Dead Sea (also not a sea and now two distinct lakes :( ). The last time they did this was in 2013 following spring flooding and a need to replenish the Jordan River. This is something I would love to see again but it won't be this year. The Lower Red Line is the point at which they are supposed to stop pumping water as any lower causes ecological damage and the water quality deteriorates. There is 4.2 metres between the two lines and we are only at about 1 metre above the Lower Red Line. We need to be a good two meters above the Lower Red Line in order to stay above it for the duration of the summer as 1 cm per day can evaporate in the hot weather. Apparently there's still lots of snow on Mt Hermon to melt and, amazingly, it's still raining - with another storm expected this week! I check on the level daily. I'm a bit nerdy like that. I have to mention that there is also a Black Line, 1.87 m below the Lower Red Line, which is below the pipes so you couldn't pump even if you wanted to. This is also the historical minimum. When things get this dangerous they plan to pump sea water from the Mediterranean into The Kinneret. But we absolutely don't want to go there again! There's something exciting about heavy rain in springtime because you know the summer is coming so you don't get depressed thinking that this is the situation for the next three months. I intend to enjoy every minute of what could be the final storm this year. I didn't get round to doing Reasons 2B Cheerful last week and this week I'm mega late. So lots of catching up to do. The linky is with Becky on Lakes Single Mum. 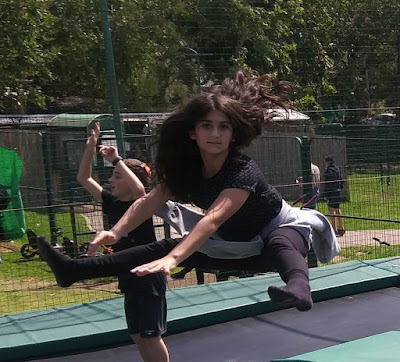 There were trampolines in the park and elastic jumping thingies that the children loved. We also brought roller blades and scooters so we were well prepared for a long day in the sunny weather. And the weather didn't disappoint. On the way there we commented that there were loads of butterflies everywhere. And in the park there were even more. The next day there were reports in the news about how millions of Painted Ladies had swarmed all over Israel on their annual migration from Arabia and Africa to Europe for the summer. It happens every year but because of the high rainfall this year, there were more than ever before. Apparently these exact butterflies won't survive to make the journey back south in the autumn, but their offspring will. We returned to Jerusalem on Thursday afternoon to go to the reading of the Purim Story (The story of Queen Esther) at our friends' house. The 'rule' is that you are supposed to hear it read twice - once in the evening and once in the morning. It's great fun. Many people in fancy dress and every time you hear the name of the wicked Haman, you shake your noise makers and hiss. As fun as it is, once a year is enough for me. I had intended that DD sit with me to hear it too but the other children disappeared downstairs to play so she also disappeared. However, she'd already heard it in school last Tuesday so she was covered. After the reading, we all eat. People bring food to contribute to the meal. There are some very wonderful and creative cooks in this crowd. I bought stuffed vine leaves and carefully took them out of the tin before leaving home so they looked a bit home-made. They almost all got eaten so that's what's important. On the Friday, which was Purim in Jerusalem, DD and I delivered some Mishloach Manot (food parcels) and then went out for lunch. Just the two of us as we'd had our Purim meal in the park the day before. One family turned up at our house dressed as characters from The Wizard of Oz with a basket containing all sorts of Oz symbols. The miniature liquid courage has gone down well in a hot toddy each night for me. And I have one serving left for tomorrow night too. We stayed in on Friday night but went to friends for lunch on Saturday. A great end to a lovely, low key and relaxed Purim weekend (except for the Costume Drama on Tuesday). And now I'm writing this during a massive electrical storm over Israel. It's of The Sound of Music proportions. I'm a little disappointed that DD hasn't woken up and come running into my room so we can sing My Favourite Things while jumping on the bed. If you've been reading my blog for a number of years, you'll know that DD hates dressing up. Since the age of two, she's refused to dress up in a costume for Purim. Purim, the festival where even adults in the streets can be seen wearing silly clothes and costumes, is a nightmare for DD. I've given up trying to persuade her and she usually goes to school, the only child in her class without a costume. And she doesn't care. Or, like last year, she doesn't go to school. This year she was invited to go shopping for a costume with her best friend. She declined even though I said she could choose anything she likes from the costume shop. And costumes for DD's size can be up to 250 nis (£50). We have a giraffe onesie in the wardrobe but for sure that wasn't coming out. And so I thought another costumeless year would go by. Then, on Sunday, on the bus, on my way home from school, DD phoned me. "Mummy, do we have anything that I could use to be a girl pirate? I just don't want to be the only one with nothing for a costume." So I got off the bus three stops early and went into Max Stock (like Poundland). I found one Alice-band with a pirate hat, a hook, and a plastic telescope. 5 shekels each. Today was the day that all the kids dress up for school. DD woke up this morning and refused to go to school. She had to go as she had to reveal herself to her secret friend - they've been playing Giants and Dwarfs in the class. So she agreed to go but she wasn't dressing up. Obviously it wasn't about the money, but I was fed up with the dithering. I knew she'd be happy once she got there. The costume was the most unridiculous costume you could find. I would wear it, without the hat and hook, on a normal day... if I looked as good as DD did in it. So I did what any mother would do. I threatened to take away her phone and her computer, and I pushed her out of the front door in tears. By the time she got downstairs she had already taken off the hat and the hook. I watched some amazing costumes walking to school. DD looked up at the balcony where I was standing, and scowled. Four hours later she came home with a friend, all smiles. It had been a really fun day. "Are you pleased you were dressed up?" I asked. DD tried hard not to smile as she refused to answer.